Part of the "Heroin Screws You Up" drug awareness campaign. 1986 poster featuring a young male addict.
" At first he was sure he'd never become a heroin addict. Now he's not sure he'll ever be anything else." Part of the "Heroin Screws You Up" drug awareness campaign. 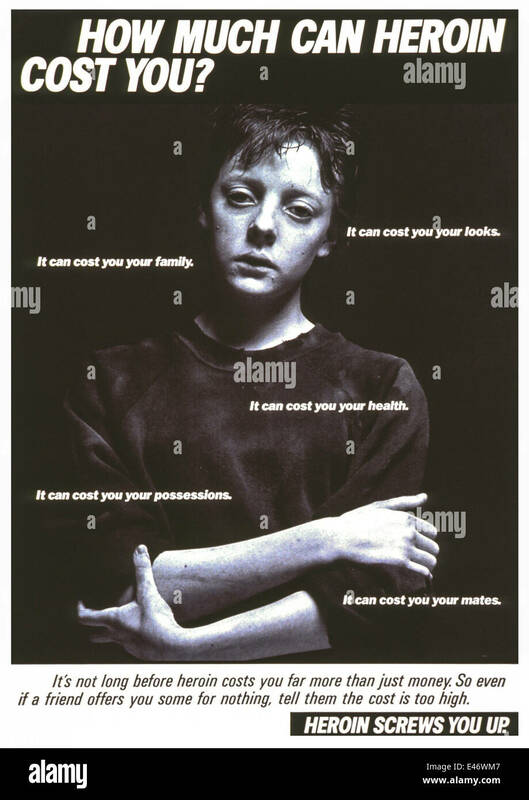 This poster featuring a grainy black and white image of a young male drug addict released in 1986 and was part of a broader campaign drawing attention to the highly addictive and potentially damaging effects of heroin addiction. The text reads: "Take heroin and before long you'll start looking ill, losing weight and feeling like death. So, if you're offered heroin, you know what to say." Ironically images such as this one became teenage pin-ups and contributed to the "heroin chic" look becoming fashionable. Part of the 'Heroin Screws You Up' drug awareness campaign. 1985 poster featuring a young male addict. 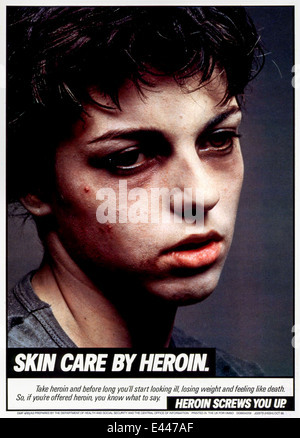 'Skin Care by Heroin.' Part of the 'Heroin Screws You Up' drug awareness campaign. 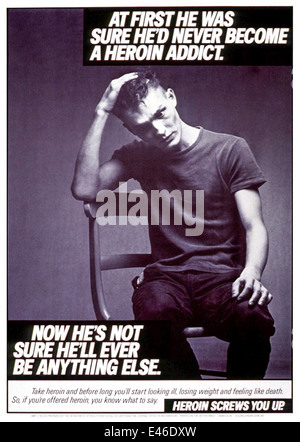 1986 poster featuring a young male addict.